The Alaska eviction notices are used by landlords to begin the process of removing a tenant from the premises for a lease violation. The landlord must identify the issue and write the tenant through a form known as a ‘Notice to Quit’. If the issue is curable, such as with a late rent payment or another issue that can be remediated, the tenant will have a suggested time-frame to remedy the issue. If the issue is incurable, such as deliberate damage, illegal activities or month to month lease termination, the tenant will be forced to leave by the end of the time period suggested. 24-Hour Notice to Quit (Deliberate Damage Inflicted to the Premises) – If the tenant has purposely and maliciously caused sufficient damage to the premises the landlord may serve an action requesting the lessee to leave the property within twenty-four (24) hours. 5-Day Notice to Quit (Illegal Activity) – If the tenant has been accused or caught conducting illegal activities on the property they shall have five (5) days to remove themselves and their possessions from the property. 7-Day Notice to Quit (Non-Payment of Rent) – If the lessee does not pay rent on the date stated in the lease agreement the lessor has the right to serve this notice. 10-Day Notice to Quit (Non-Compliance) – If the lessee has broken a part of the lease that does not have to do with the non-payment of rent the landlord must provide ten (10) days to cure the issue. If the violation has not been cured the lessee will be forced to move out at the end of the period. 30-Day Notice to Quit (Month-to-Month Tenancy) – A tenancy-at-will and either the landlord or tenant wish to cancel then this form may be completed to terminate the lease by providing at least thirty (30) day notice. 7-Day Notice to Pay or Quit (CIV-725) – Gives seven (7) days before the tenant must pay what is owed on the rent or vacate the premises. Answer (CIV-735) – Must be filed by the tenant within twenty (20) days of receiving. Case Description (CIV 125D) – Known as a “cover sheet” in other States, this tells the court what type of case is being filed. Memorandum to Set Civil Case For Trial (CIV-200) – Used only if the landlord wins the eviction lawsuit and wants to press further by filing a civil lawsuit against the tenant to obtain monetary damages. Official Guide / Instructions (CIV-720) – Additional information in order to help the landlord successfully process a Forcible Entry and Detainer. Service Instructions (CIV-615) – Instructions that will be given to the process server to inform the tenant of an eviction that has been filed against them. Writ of Assistance (CIV-575) – Only used if the judge rules against the tenant and they do not vacate the premises by the court set time. Gives a peace officer the right to remove the tenant. In addition to the steps below, the State of Alaska has made an Official Guide (CIV-720) to help the landlord complete the eviction process. 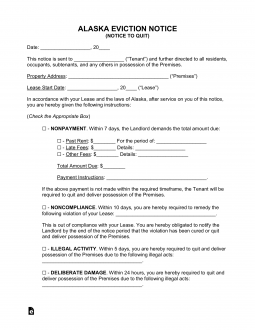 Step 2 – After serving the tenant with the appropriate form and they remain on the property, in violation of the notice, the landlord must file the Complaint (Form CIV-730) (Attach a copy of the Notice to Quit). A fee for the amount of $125. Although, it is always best to double-check with the court as the price is always changing. Step 3 – A copy of the filed Complaint (CIV-730) and Summons (CIV-105) must be sent to the Defendant. The Service Instructions (CIV-615) must be used to guide the process server. After the Defendant has been served they will file a form called the Return of Service that will be served to the landlord and the court. Step 4 – The tenant will have a maximum of twenty (20) days to file an Answer (CIV-735) with the court. Step 5 – Both parties should attend the hearing and the Judge will only rule on whether the landlord is entitled to possession of the property and not if they are granted damages. After the hearing is complete and the landlord would like to get damages the court will typically automatically set an additional trial hearing. If not, the petitioner will have to file the Memorandum to Set Civil Case For Trial (CIV-200). The name of who this notice is being given to along with the address of the property should be entered into the header of the notice. The date of the lease signature date should be entered as to recognize which agreement this notice is referring to. If the notice is being given by the landlord to the tenant due to the non-payment of rent then the first (1st) checkbox should be marked. This gives the tenant a total of seven (7) days to pay all that is due (should be entered) along with recognizing the dates for which rent is late. Non-Compliance with the Lease – This gives the tenant ten (10) days to fix the issue and the exact violation that was conducted should be entered. Illegal Act – If an illegal act was conducted by the tenant then there is no right to cure and the tenant has a total of five (5) days to remove themselves from the property. Damage to the Premises – If the tenant has conducted significant damage to the premises and a total of twenty-four (24) hours is given to the tenant to vacate. If either the tenant or the landlord is submitting this form due to their desire to end a monthly tenancy relationship then either one (1) of the two (2) boxes should be checked depending on the party that is requesting to quit. Either the landlord or tenant must give at least thirty (30) days notice to the other party. The landlord or tenant, whoever is sending the notice, must authorize the notice and check the box as to how they will be sending the form. Most States require that the form is hand delivered, posted on the property, or sent through the certified mail with return receipt (the receipt will be needed as proof the tenant received the document).